For those of you who have rugs on Hard Floors like Wood, Laminate, Natural Stone etc… may have experienced the phenomenon known as ‘Rug Walking’. This is where the rug keeps moving from where it is supposed to be. This can be annoying and sometime a bit dangerous, especially if it’s a small rug and it moves around quite easily. Also, did you know that when you walk on your rug against any hard floor, you can be causing premature wear and tear by grinding the rug against the hard floor as you walk on it? How to stop your rug walking! A great solution to this mildly annoying problem is Rug Underlay. 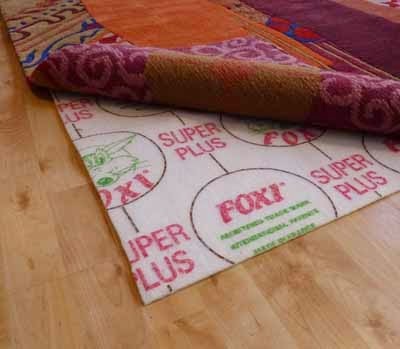 The best Rug Underlay to stop ‘rug walking’ in its tracks is Foxi Rug Underlay. Foxi Rug underlay is cut to the size of your rug and placed underneath which stops the rug from creeping across the floor. It also provides a cushion for your rug against a hard floor that protects it from premature wear and tear as you walk on it. Foxi underlay is slightly tacky that helps it to adhere to the rug and floor, but it doesn’t leave any messy residue that can be left on the rug or floor from other anti-slip systems like sticky tapes etc. You can easily remove it from the rug and place it somewhere else with no mess and no hassle. If comfort and a lovely soft tread is what you want then, the other rug underlay we can provide to you is Monarch. This is a much thicker underlay designed for comfort and cushioning of the rug rather than slippage. If you want the feeling of a very soft underfoot when you walk on your rug then this is for you. Again, it is cut to size and placed underneath the rug. 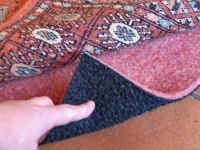 It is also a great solution for protecting your rug from premature wear and tear. Let me know how you stop rugs from shuffling across your floor, I’d love to hear in the comment box below.